How do I delete an incorrect pedigree-only sire, that I accidentally added in the Edit Animal screen? 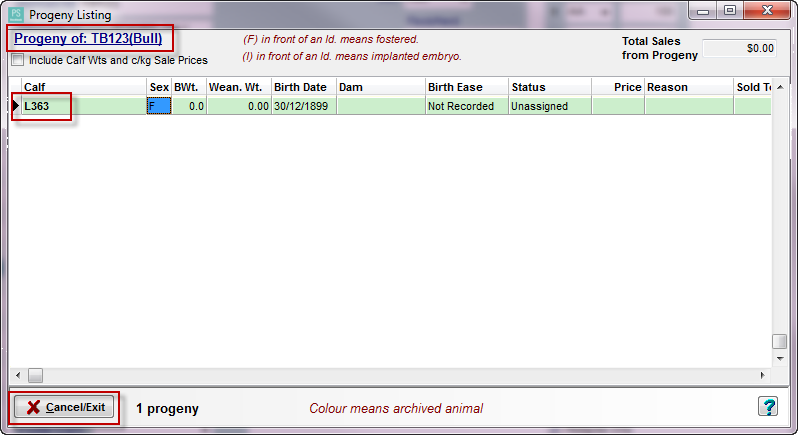 A sire can be added via the Add/Edit Animal screen (of any animal), in the Birth Details section, by clicking on the + beside the entry point for Sire. Any animal added this way is for pedigree purposes only, and will be Inactive. Such animals will not appear as live animals in your herd. In your Current Animals screen, tick the Include Inactive button at the bottom left of the screen. In the Search For Animal box at the top left of the Animals screen, type in the Identification of the Sire you wish to delete. Click on the blue Progeny tab at the bottom-left of the screen. The Progeny Listing is a list of the animal's (sire's) progeny history. If the sire does not have any progeny, go to Step 5. If the sire does have progeny, make a note of the each primary Id. (eg. ear tag), go to Step 4. Search for each progeny identified above, eg. L363. Click OK button to save. Click on the Delete button at the bottom of the screen.